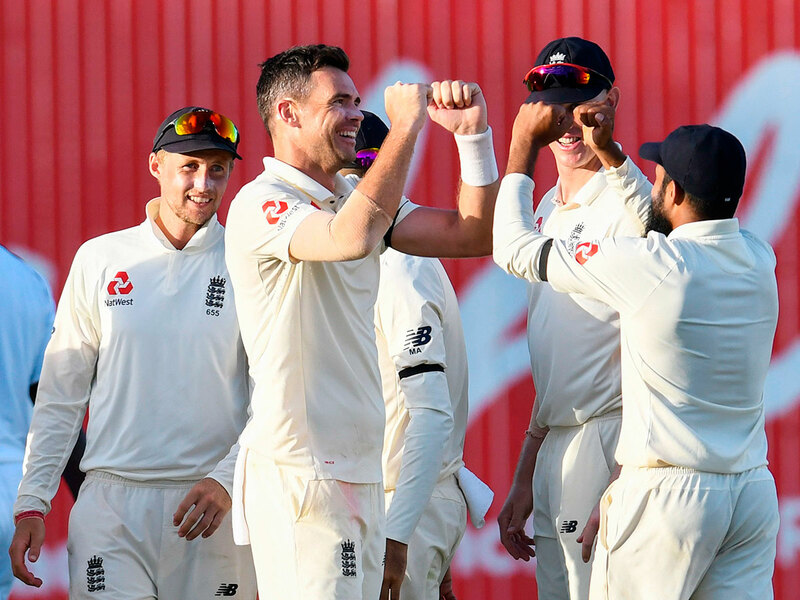 Barbados: England picked up four late wickets with the second new ball to turn the first Test against West Indies in their favour, leaving the hosts reeling at 264 for eight at stumps on the first day in Barbados on Wednesday. James Anderson tore through West Indies’ middle order in a devastating late spell, while Ben Stokes chimes in to claim tail-ender Kemar Roach for a duck with the final ball of the day at Kensington Oval in Bridgetown. While England selected two spinners in Mooen Ali and Adil Rashid, raising eyebrows by leaving out Stuart Broad, it was Stokes and Anderson who did the damage. Stokes collected two scalps with the old ball, before Anderson struck three times with stumps looming. The veteran first had Roston Chase caught at first slip for 54, before Shane Dowrich (0) spooned a catch to second slip. Anderson then snaffled all-rounder Jason Holder caught-and-bowled for five as the large contingent of English fans in the crowd finally found their collective voice. Anderson finished the day with 4-33 off 24 miserly overs, including 12 maidens, while Stokes had 3-47. Anderson’s excellent harvest was a welcome change from a barren visit to Sri Lanka, where he took one wicket in two Tests. “I’ve always enjoyed the challenge away from home but it’s often been difficult to get to grips with conditions,” he said in quotes published by the Guardian newspaper. “I guess it’s getting to know my game and getting my skills and confidence up. “Now I feel I can bowl on most pitches, though you could probably take Sri Lanka out of that. While it was a promising day for the hosts until the final hour, they could pay the price for the inability of any of their top order to convert good starts into big scores. Five of their batsmen made at least 40, but none reached 60. Openers John Campbell (44) and Kraigg Brathwaite (40) got the innings under way before Shai Hope (57) and Chase (54) managed half-centuries, while Shimron Hetmyer was 56 not out. West Indies could have been in an even more dire situation had not Hetmyer been let off on three when dropped at extra cover by Jos Buttler. The 22-year-old was then rarely troubled again as he took to the England attack, before the visitors’ dragged themselves back in the final hour. West Indies first innings: 264-8: Hope 57, Chase 54, Hetmyer 56; Anderson 4-33, Stokes 3-47.